After 40 Years in business, we're at the top of our game. And we're growing! Be a part of our success, we'd love to be a part of yours. Eversoft offers medical, dental and vision coverage, life insurance, a generous match on a 401k plan, vacation and holiday benefits. Drives bobtail truck over established route to deliver products or render services, collects money from and makes changes for customers by performing the following duties. Drives truck to deliver water conditioning equipment to customer's place of business. Collects money from customer and records transactions on customer receipt. Issues or obtains customer signature on receipt for pickup or delivery. Writes customer order and instructions. Listens to and resolves service complaints at customer locations. Collects or picks up empty containers or rejected or unsold merchandise. Records sales or deliveries information on daily sales or delivery record. Loads truck. Cleans inside of truck. Performs routine pre-trip inspection of truck. High school diploma or general education degree (GED); or one to three years related experience or training; or equivalent combination of education and experience. Ability to add, subtract, multiply, and divide in all units of measure, using whole numbers, common fractions, and decimals. Ability to compute rates and percentages. Valid class B California driver’s license with airbrake and manual transmission, and good driving record. Bus or Passenger CDL is not sufficient for this position. Valid license and medical certificate must be available at time of interview. While performing the duties of this job, the employee is regularly required to use hands to finger, handle, or feel objects, tools, or controls and talk and hear. The employee frequently is required to sit and reach with hands and arms. The employee is occasionally required to stand; walk; climb or balance; stoop, kneel, crouch, or crawl; and taste or smell. The employee must frequently lift and/or move up to 50 pounds and occasionally lift and/or move up to 100 pounds. Specific vision abilities required by this job include close vision, distance vision, color vision, peripheral vision, and depth perception. While performing the duties of this job, the employee occasionally works near moving mechanical parts and in outside weather conditions and is occasionally exposed to wet and/or humid conditions, fumes or airborne particles, and toxic or caustic chemicals. The noise level in the work environment is usually moderate. Drives truck to deliver bags of salt and related equipment and supplies to customer's place of business. 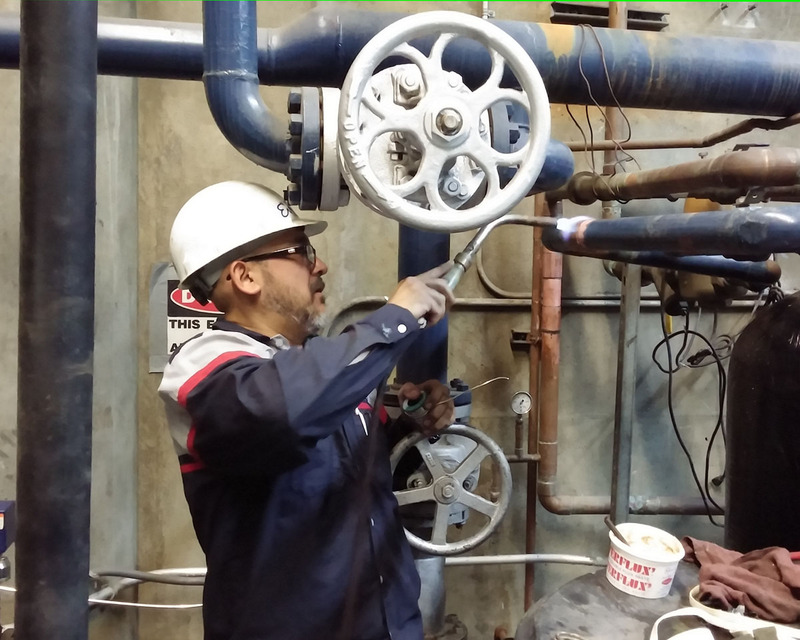 Installs, maintains and repairs water conditioning equipment, pipe and related electrical systems in commercial, industrial, and residental establishments by performing the following duties. Visually inspects and tests machinery and equipment. Listens for unusual sounds from machines or equipment to detect malfunction and discusses machine operation variations with supervisors or other maintenance workers to diagnose problem or repair machine. Studies building plans and working drawings to determine work aids required and sequence of installations. Locates and marks position of pipe and pipe connections and passage holes for pipe in walls of floors. Cuts openings in walls and floors to accommodate pipe and pipe fittings. Installs and repairs electrical apparatus, such as transformers and wiring, and electrical and electronic components of machinery and equipment. Dismantles defective machines and equipment and installs new or repaired parts. Cleans and lubricates shafts, bearing, gears, and other parts of machinery. Installs, programs, or repairs automated machinery and equipment such as programmable controllers. Operates cutting torch or welding equipment to cut or join metal parts. Assembles and installs valves, pipe fittings, and pipes composed of metals, such as iron, steel, brass, copper and nonmetals, such as plastic. Repairs and replaces gauges, valves, pressure regulators, related equipment. Joins pipes by use of screws, bolts, fittings, solder, plastic solvent, and caulks joints. Fills pipe system with water or air and reads pressure gauges to determine whether system is leaking. Collects money and issues receipt. Ability to calculate figures and amounts such as discounts, commissions, proportions, percentages, area, circumference, and volume. Valid class C California driver's license and good driving record. While performing the duties of this job, the employee is regularly required to use hands to finger, handle, or feel objects, tools, or controls; and reach with hands and arms; talk and hear. The employee frequently is required to stand and sit. The employee is occasionally required to walk; climb or balance; stoop, kneel, crouch, or crawl; and taste or smell. The employee must frequently lift and/or move up to 50 pounds and occasionally lift and/or move more than 100 pounds.